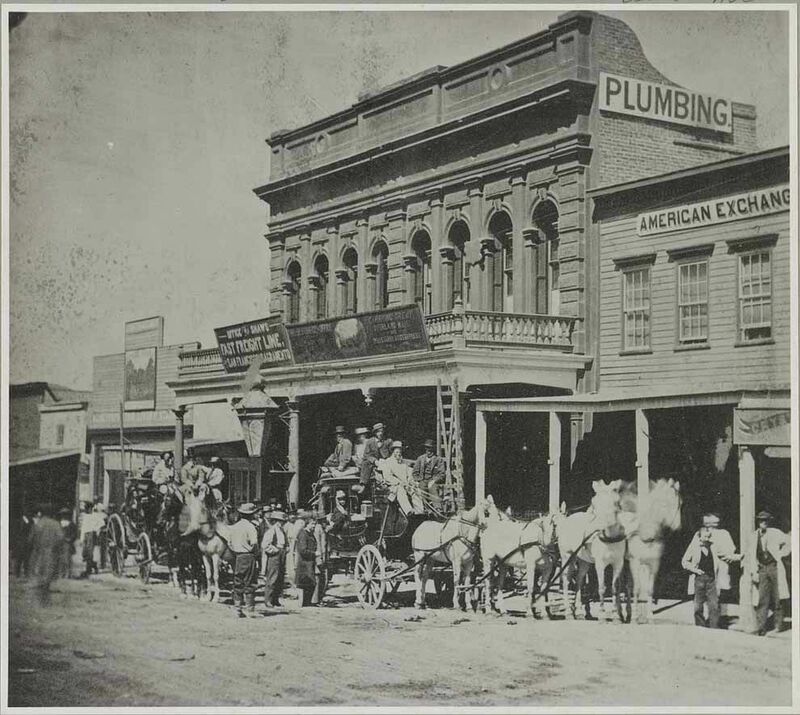 On March 18, 1852, East Coast businessmen Henry Wells and William G. Fargo founded a company—Wells Fargo—to deliver mail to the frontier of California. The stagecoaches of Wells Fargo, founded as a cross-country shipping company, quickly became a symbol of the Old West. The company transferred millions of dollars in silver ore from this office in Virginia City, Nevada. On March 18, 1852, Henry Wells and William Fargo founded the company that would bear their name. The two men were already wealthy business owners, serving as the first president and vice-president of American Express, which they helped establish two years earlier. Like American Express, Wells Fargo was originally an express-delivery business. The company guaranteed delivery of mail, packages, and other goods safely and efficiently. After the discovery of gold in California in 1849, the Wells Fargo stagecoach became a symbol of the American West—shipping machinery, freight, and finished goods from the East Coast to the frontier. It also delivered valuable ore, documents, and mail from the West to the east. After the completion of the transcontinental railroad, both Wells Fargo and American Express relied less on their shipping businesses. Instead, both companies thrived—and continue to thrive—as banking and financial services firms. U.S. states west of the Missisippi River. something seen, documented, or noticed for the first time. goods transported by air, land, or sea for profit. covered vehicle pulled by horses, used to transport people and cargo.